ITDP aims to deliver a higher standard of living and quality of life for citizens of cities around the world. Through our transportation projects, we work to reduce human impact on natural resources and ecosystems, and to ensure that we develop in a way that benefits us all, both today and in the future. Our vision of sustainable cities is one in which there is a high concentration of people living in an environment that is pleasant and provides good social infrastructure through good physical infrastructure. Cities where people are put before cars, and residents, workers and visitors young and old, can safely walk or cycle to their daily activities. Cities where jobs and services are a bus ride away, and the time and money spent driving can be used productively elsewhere. These are the kinds of cities that are attractive to us today – cities with less congestion, less pollution, fewer accidents, and healthier, safer, more productive communities. To achieve this, there are 8 principles which guide our approach to sustainable transport and development. These principles inform the TOD Standard, a guide and tool to help shape and assess urban developments. Micromobility: The key to melding transit and urban design? How will the shifting mobility landscape impact the design of sustainable cities? If you’re an automaker, now might be the time to drastically rethink not only your target audience, but also the fundamentals of how vehicles are designed, manufactured and marketed. Forces like global urbanization, the growth of electric vehicle infrastructure and shared mobility services — ridesharing, carsharing, bikesharing, etc. — are dramatically changing the sustainable transportation landscape. To help make sense of it all, GreenBiz spoke last week with mobility designer Dan Sturges about the outlook for personal cars and the market forces reshaping the suto industry. This week, in and interview edited for length and clarity, Sturges shared his thoughts on what our future cars might look like, and how all of these factors might combine to reshape our sense of place. GreenBiz: What might the new constellation of vehicle options for businesses and consumers mean for the future? Dan Sturges: To me, both Silicon Valley and Big Auto are not very focused on the massive opportunity that comes with a broader selection of optimized vehicle designs in the future of shared mobility. Today, we generally use two classes of mobility. One, mainly, is our cars and light trucks to drive us each day around our cities and metropolitan regions. The second is the airplane that we fly to far-away cities and countries. What has been missing is a third tier — one focused on local transportation. That would be a travel environment for walking, bicycles and a wide range of upcoming micro-mobility (powered) vehicles. GreenBiz: So you’re saying our current local transportation patterns are unsustainable? Sturges: Let me be very clear. We currently have an automobile monoculture on this planet, and it’s not good for us.Today, the billion cars and light trucks we have on the planet look virtually the same when looking down on them. They are rectangles with four wheels in the corners and roughly the same size. They are constructed out of 25,000 parts and cost $32,000, on average, in the US. Why would anyone need all that to travel a mile or two for a meeting at a coffee shop? GreenBiz: And you see an opportunity to simplify? Sturges: Nearly 50 percent of our trips in urban areas are less than three miles, and 28 percent are one mile or less. Our cars are over-engineered for nearly every trip we take in them. It’s overkill. It’s like killing a roach with a shotgun. We could not do anything about this before the auto tech revolution, but now we can. The centerpiece of the local mobility future is the bicycle. While auto mobility develops in the future with the cars we drive, autonomous vehicles or other inventions, we will be redesigning our cities to offer amazing pedestrian, bicycle and active mode facilities first and foremost. GreenBiz: What if you’re not into biking or walking all the time? Sturges: For those of us that want more than a bicycle for a nearby trip, we will choose from a growing array of local vehicles. This will include electric bikes, e-scooters, senior mobility scooters, golf cars, Neighborhood Electric Vehicle (NEVs), and a likely wide array of new types of near cars. All of these vehicles require far less land and energy than a car, and cost far less to own, share, or operate than our cars of today. They are optimal vehicles for a short trip. GreenBiz: What about longer trips? Sturges: Think about a metropolitan area divided into two vehicle categories: the local vehicles I am talking about, and the far cars – the conventional vehicles we know and use already today by the billion. A Nissan Land Glider concept car. It’s helps to think of the neighborhood you live in as a small island, maybe two square miles. Let’s say you live in Palo Alto, California and you are a telecommuter, so your needs for an automobile are already really reduced. You might use a new-type of local shuttle service, ridesharing, carsharing, bike or walk to get around Palo Alto.If you’re a commuter, there will be another option: a narrow car. The Nissan Land Glider concept vehicle paints a picture of a new type of car to drive around your region. Cities encouraging the right-sizing of personal vehicles will benefit by reducing traffic congestion, along with reducing the amount of land needing for parking. GreenBiz: Are there existing templates for how all of this might come together in real cities? Sturges: In European cities moving toward a car-free model, like Madrid, new urban shuttles — a mix of autnomous and driver-controlled — will offer frictionless use for consumers. GreenBiz: But retrofitting entire cities at scale would be a massive challenge. Sturges: It’s difficult to get a city saturated with big cars and trucks to clear an appropriate amount of space for a healthy local mobility zone. The car is still considered king, and cities like LA are having big fights with citizens about removing even a few car parking spaces for bike lanes. This drives me crazy — LA plans to fund its much-needed biking infrastructure over a 20-plus year period. I think that’s absurd, given the climate crisis, economic challenges, terrible traffic and so on. Many people like little e-scooters and NEVs, but they don’t feel safe operating them around a sea of giant SUVs. I don’t blame them. In addition, hardly any citizens have been introduced to this type of new vision for a shared-use and right-sized metropolitan mobility future. If you don’t know something is available, how are you going to even want it, and seek government to support it? GreenBiz: Long term, how do you see this potential convergence influencing the way we build our cities? Sturges: Did you ever see Otis Elevator’s dual-dimensional elevator concept from the early 1970’s? It was super cool. The elevator not only went up and down, it could travel horizontally as well. Small electric vehicles are about the same size of some elevator cars. They have zero emissions and will actually be able to drive into a building and right into one’s condo in the future. The design opportunity of this convergence of architecture, local mobility, and the Internet of Things (IoT) is very exciting to me. 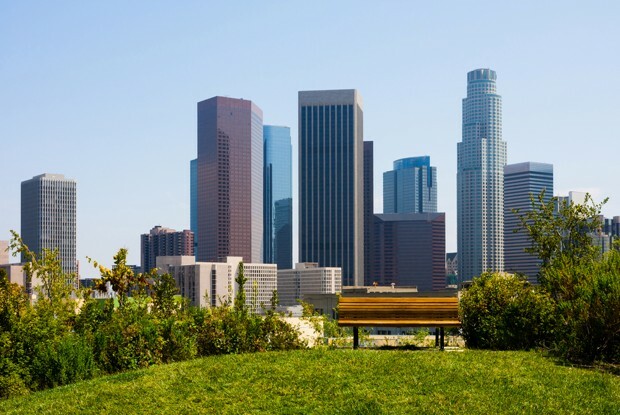 GreenBiz: What sorts of applications do you think about for urban settings? Amazon-owned Kiva, a pioneer in mobility robotics. Sturges: Upcoming automated, local mobility technologies will enable all new types of futuristic smart communities and cities to be created, as well as informing the retrofit process of our existing cities.Have a look at Kiva Systems. Their remarkable warehouse movement robots can now be applied to a number of important new urban living applications. This technology enables new types of cities and futuristic smart communities to be built, that park cars on the edge and offer large non-motorized zones for people, as well as a secondary micro-sized, high-tech automated movement systems for both people and goods. It might seem obvious, but in lots of cities it’s also proved quite effective. In Charlotte, North Carolina, people who have a history of homelessness, as well as physical or mental disabilities, can get their own apartment at a non-profit-run, 85-unit complex called Moore Place. The development runs on the “housing-first” approach to homelessness: give people the keys to their own residence, then try to resolve the issues that led them to lose their homes. The model essentially flips a more longstanding approach that many people call the “treatment-first” model, which focuses on fixing the problems before providing the housing. Despite its limited applications, the housing-first approach has been successfulin a number of cities, and a new study suggests Moore Place is no exception. Researchers at the University of North Carolina-Charlotte report that not only do housing projects like Moore Place dramatically help the homeless population, but they also help cities save money and free up civic resources. At Moore Place, it costs around $14,000 per year to house someone. About 30 percent of this cost comes from tenant incomes. The rest is covered by donations and public funding, the new report explains. The positive returns have been quite dramatic. A study team led by Thomas surveyed Moore Place tenants four times: right when they moved in, then at six months, a year, and two years later. They found that, after two years, 81 percent of tenants who participated in the survey remained in permanent housing. Before they’d moved into Moore Place, these tenants had been homeless an average of 7 years. Not only did Moore Place tenants maintain the roof over their head, but their relationships with the health care system started to change, Thomas explains. 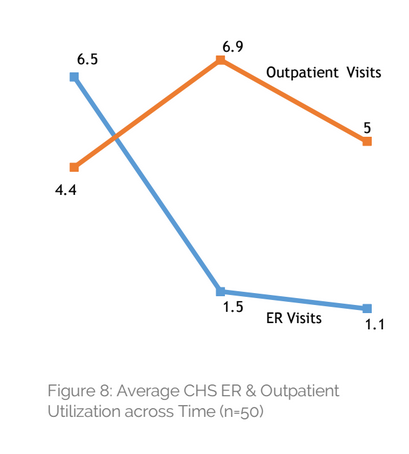 Two years into their stay, emergency room visits and hospital visits decreased by 81 percent and 62 percent, respectively (below, top); they also used the county medics 76 percent less. 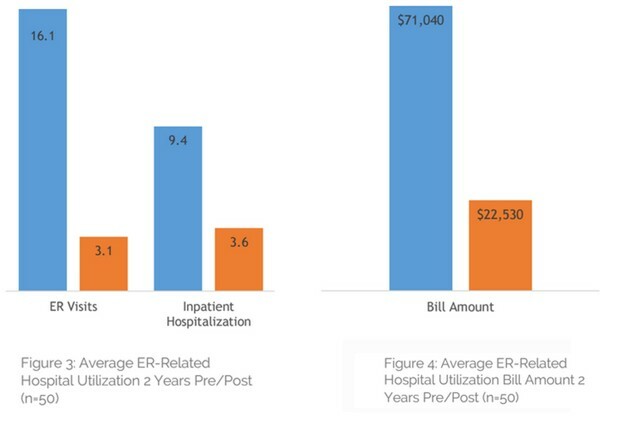 Their total hospital billing decreased by $2.4 million—that’s a 70 percent reduction (bottom). The study also found that since Moore Place residents stayed off the streets, they stayed out of jail. Arrests for petty street offenses and small crimes decreased by 80 percent, and nights in prison came down by almost 89 percent. As far back as 2001, researchers at the University of Pennsylvania declared that providing housing to the homeless is a “solution that can pay for itself.”Seattle, for instance, saved a lot of money with its housing-first program for recovering alcoholics. The Pathways to Housing program, which started in 1992 in New York City and was one of the initial housing-first programs, saved the public up to $42,893 per year, according to a 2011 report. Homeless people are not cheap to take care of. The cost of shelters, emergency-room visits, ambulances, police, and so on quickly piles up. Lloyd Pendleton, the director of Utah’s Homeless Task Force, told me of one individual whose care one year cost nearly a million dollars, and said that, with the traditional approach, the average chronically homeless person used to cost Salt Lake City more than twenty thousand dollars a year. Putting someone into permanent housing costs the state just eight thousand dollars, and that’s after you include the cost of the case managers who work with the formerly homeless to help them adjust. Still, the housing-first model still has its opponents, partly because people assume that “housing-first” means “housing-only,” Thomas says. That’s not the case. Many Moore Place tenants still work with social workers, therapists, and medical workers. But this help comes after their housing arrangement has been sorted out. The other problem is flipping the way homelessness services are traditionally provided—help first, home second—isn’t easy. Creative jobs and industries help advance city economies—but they also bring with them serious economic divides. By now, we know that the clustering of companies and talent in urban areas drives innovation and economic growth. But it also generates distinct winners and losers both across and within cities and metros. This is the upshot of my new study with my Martin Prosperity Institute (MPI) colleagues Roger Martin, Melissa Pogue, and Charlotta Mellander, which was published as part of a special journal issue in honor of the 25th anniversary of Michael Porter’s landmark book, The Competitive Advantage of Nations. Porter is known for his research on the role of clusters of firms in economic development. Our study brings together Porter’s seminal work on industrial clusters with my research on the clustering of talent and occupations. While Porter’s work distinguishes between more locally-oriented and traded industries that export goods and services outside of their immediate geographic areas, my work distinguishes between creative, knowledge-based occupations in science, technology, design, and entertainment and routine occupations in manufacturing and services. 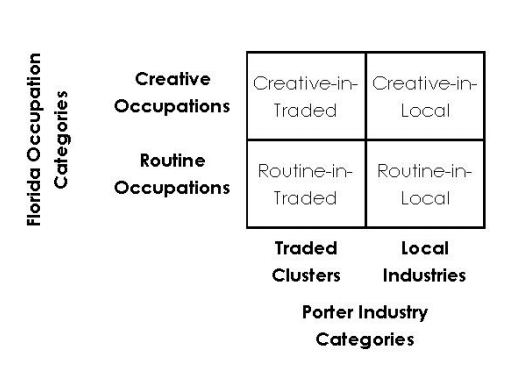 The chart below shows how we marry these two approaches, combining them to generate four distinct occupational-industrial categories: creative occupations in traded industries (which we call creative-in-traded), creative occupations in local industries (creative-in-local), routine occupations in traded industries (routine-in-traded), and routine occupations in local industries (routine-in-local). Our analysis examines the role of these four types of industries in innovation, economic growth, and inequality across some 260 metro areas that account for more than three-quarters of the U.S. population. To start, our study finds a clear connection between traded industries and creative occupations. According to our analysis, 46 percent of workers in traded industries are in creative jobs, compared to 35 percent in local industries. This is not surprising, since traded industries compete on innovation and creativity. The next two maps and table show the spiky geography of these competitive creative-in-traded jobs across U.S. metros. 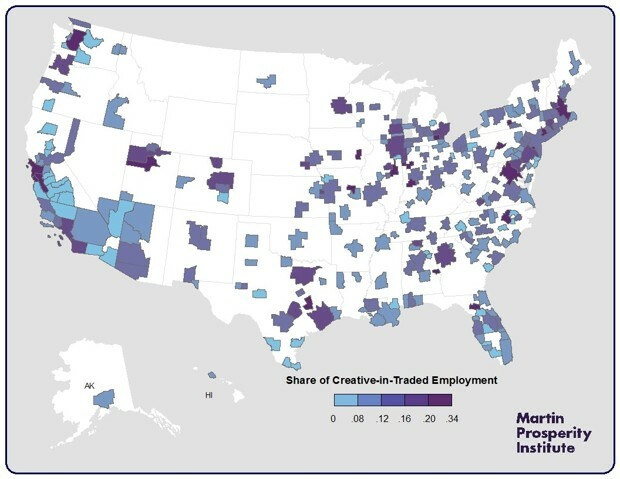 The first map, above, shows the geography of creative-in-traded employment. This category is highly uneven across the country, although it does concentrate on the East and West Coasts. As the table below shows, the leading center for creative-in-traded employment is San Jose, where creative-in-traded jobs make up a third of employment, followed by nearby San Francisco. Next comes Boston, followed by Raleigh in the North Carolina Research Triangle, Seattle, Washington, D.C., and Austin, where creative-in-traded jobs make up roughly a fifth of employment. 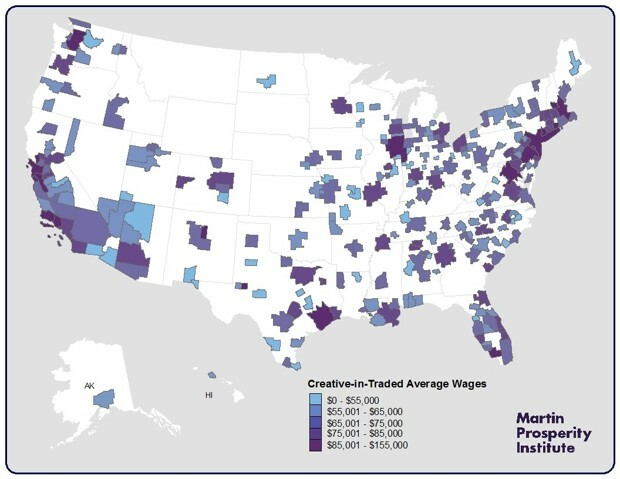 The map below shows the average wages of creative-in-traded workers across all metros. Again we see a clear bi-coastal pattern with the highest wages concentrated along the West Coast (the Bay Area, greater L.A., and Seattle) and the Boston-New York-Washington Corridor on the East Coast, as well as leading knowledge and tech hubs in other parts of the country. 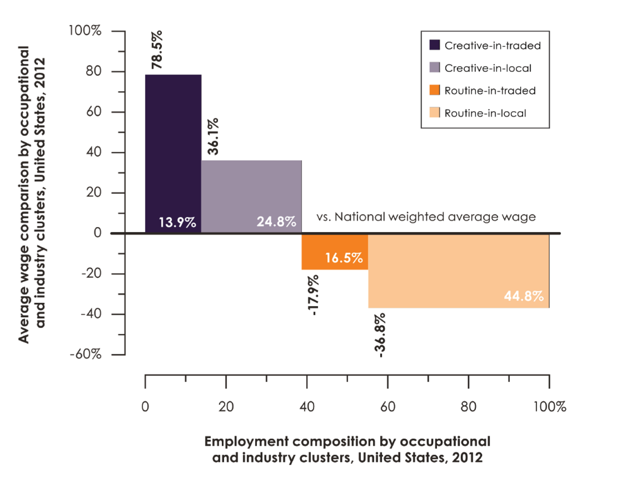 In both cases, the geography of creative-in-traded employment is extremely spiky. Creative-in-traded employment is a key driver of both innovation and economic growth, according to our analysis. It is positively associated with higher levels of innovation (with a correlation of .61), higher levels of economic output per capita (.53), and higher wages (.6). (As usual, we note that correlation does not equal causation, but simply points to associations between variables). That said, creative occupations are more closely associated with innovation and economic growth (with correlations of .52 to economic output, .52 to patents, and .66 to wages) than traded industries (with correlations of .38 to economic output, .35 to patents, and .25 to wages). Furthermore, creative-in-local jobs are modestly associated with wages (.34) and economic output (.17), but not with innovation. On the other hand, both routine-in-traded and routine-in-local jobs are negatively correlated to wages and innovation, while only routine-in-local jobs are negatively associated with economic output per capita. Our study also sheds additional light on the winners and losers of this increasingly spiky, knowledge-intensive, trade-based economy. 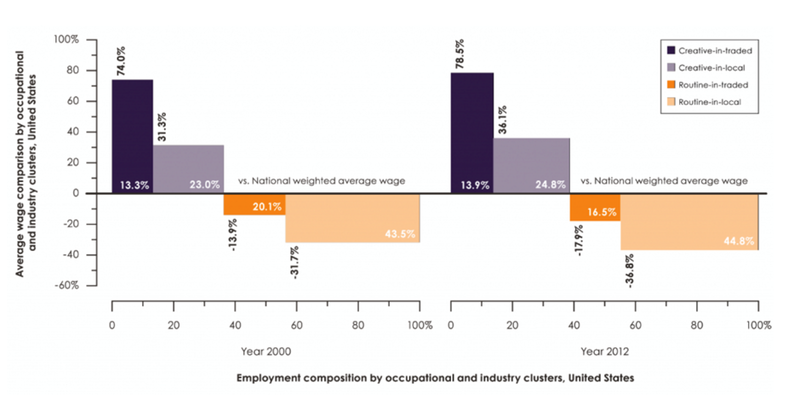 As the chart below shows, creative-in-traded industries have far and away the highest wages out of the four categories, despite employing the smallest share of workers. Their average salary ($79,000) is 31 percent more than the wages of creative-in-local workers, 117 percent more than those of routine-in-traded workers, and 182 percent more than those of routine-in-local workers. On the other side of the spectrum, workers in routine-in-local industries—which make up the largest category and represent 45 percent of all workers—have the lowest wages. These trends are even more pronounced when we track them over time. As the chart below shows, the share of creative-in-traded workers increased from 13.3 to 13.9 percent between 2000 and 2012, while the share of routine-in-local workers increased from 43.5 to 44.8 percent. Furthermore, the wages of creative-in-traded workers increased from 74.0 to 78.5 percent above the national average wage, while the wages of routine-in-local workers fell from 31.7 to 36.8 percent below the national average. The wage gap between creative and routine workers—and between creative and routine metros—has increased considerably over time. Troublingly, our research finds a rather close connection between creative-in-traded employment and inequality. The share of creative-in-traded jobs is positively associated with income inequality (.31). In other words, the higher the share of creative-in-traded employment in a metro, the more unequal it is. The share of routine-in-traded jobs (largely in manufacturing), for instance, is negatively associated with inequality (-.20). This divide is magnified by housing costs, which are higher in more knowledge-based metros. To get at this, we ran correlations between the share of creative-in-traded workers and both overall wages and those left over after paying for housing for each group. All four categories of workers have higher wages in more creative-in-traded metros. But, when we take housing costs into account, we find distinct winners and losers in these more advanced, knowledge-based metros. On the one hand, the two groups of creative workers end up being better off after paying for housing, with positive correlations for both creative-in-traded (.33) and creative-in-local (.36) workers. For both categories, their wages rise enough on average to more than cover the increased costs of housing in these more expensive metros. On the other hand, the two groups of routine workers do not see an improvement. Our analysis found a statistically insignificant correlation for routine workers in traded clusters, and routine workers in local industries are significantly worse off (with a negative correlation of -.43). The consequences of these findings are stark. Higher wages in metros with larger creative-in-traded employment create greater incentives for more skilled and advantaged workers to migrate to these metros. 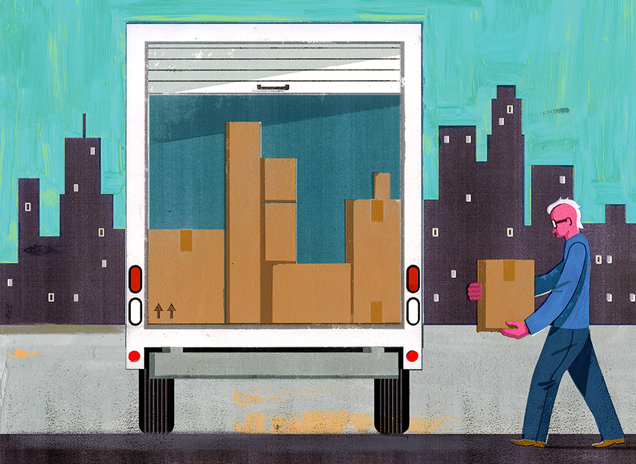 As housing costs rise, routine workers—especially those in routine-in-local jobs—are shunted off to less expensive metros which, by definition, have smaller concentrations of higher-paying creative-in-traded jobs. This creates a vicious cycle in which the advantaged become more advantaged over time, while the disadvantaged sink further into poverty. This spiky and unequal nature of the new economy provides a substantial challenge to local and national policymakers. While government can do its part by improving education and undertaking efforts to better prepare more workers for creative jobs, there are simply not enough creative jobs to go around. Today, roughly half of the U.S. workforce is in low-wage routine jobs, effectively ensuring the continued stagnation of American middle-class wages. While the proportion of creative jobs is increasing slightly, the process is painfully slow: 1.4 percent per year over the past half-century, on average. At that rate, it will take another 25 years to achieve the same amount of creative jobs as routine ones. The only way out of this dilemma is to transform routine jobs into creative jobs. As we outline in our report, the burden of change lies with business and industry, which has much to gain in terms of productivity, quality, and customer service by increasing the creative content of what is currently routine work. Moving forward, the competitiveness of cities will turn on their ability to employ more workers in creative and traded industries, and to transform their economies and workforces from routine to creative work. If you’ve ever found yourself stuck in traffic in your metro area, you might want to print out the chart below, tape it to your wall, and use it for dart practice. It comes via a guest post at the Transportationist by Wes Marshall, and it explains so very much of your earthly woe. The red line represents vehicle flow along a given road. Traffic steadily rises until someone decides the road needs to be widened. Then the original trend line (dotted red) gets replaced with an even greater travel forecast (dotted orange), as we’d expect by creating more road capacity. But the actual new level of travel developed by this widening (solid red) is even greater than the forecast predicted. First, existing road users might change the time of day when they travel; instead of leaving at 5 AM to beat traffic, the newly widened road entices them to leave for work with everyone else. Second, those traveling a different route might switch and drive along the newly widened option. Third, those previously using other modes such as transit, walking, bicycling, or even carpooling may now decide to drive or drive alone instead. Congestion is an essential mechanism for coping with excess demand for road space. We need it! Peak-hour congestion is the balancing mechanism that makes it possible for Americans to pursue goals they value, such as working while others do, living in low-density settlements, and having many choices of places to live and work. That’s not to say cities should just throw up their hands. By creating strong transit corridors, building dense housing near these areas, and charging a cost of driving that takes congestion into account, the situation can and will improve. New roads can help, too, but only for a while. Before you know it, traffic will be bad again, and local government will need new tax revenues to maintain the extra highway capacity that’s started to crumble. Hey—watch where you’re aiming that dart. Cities everywhere are facing similar problems – increasing traffic congestion and worsening air pollution, the continuing loss of open space, the need for costly improvements to road and public services, the inequitable distribution of economic resources, and the loss of a sense of community. The problems seem overwhelming and we suffer from their consequences every day. City character is blurred until every place becomes like every other place and all adding up to No Place. Many of our social, economic and environmental problems can be traced to land use practices adopted since World War II. In the late 1940’s we began to adopt a notion that life would be better and we would all have more freedom if we planned and built our communities around the automobile. Gradually, rather than increasing our freedom, auto-oriented land use planning has reduced our options. Now, it takes much more time than it used to carry out our daily activities. We must go everywhere by car – there is no other option. We must take a car to the store for a gallon of milk, drive the children to Little League practice, even spend part of the lunch hour driving to a place to eat. And as roads become increasingly clogged and services further from our home, we spend our time as anonymous individuals waiting for the traffic light to change rather than chatting with friends at the corner store or playing ball on the lawn with the neighborhood kids. Rather than designing towns so that we could walk to work or to the store, we have separated uses into homogeneous, single-use enclaves, spreading out these uses on ever-increasing acres of land. Housing of similar types for similar income levels were grouped together. Retail stores were clustered into huge structures called malls, surrounded by endless acres of parking slots. Businesses imitated the mall – creating “business parks”, usually without a park in sight, and with people working in clusters of similar buildings and parking spaces. At the same time, public squares, the corner store, main street, and all the places where people could meet and a sense of community could happen were replaced by the abyss of asphalt. The effects of single- use, sprawling development patterns are becoming increasing clear. And, with that has evolved arealization that there is a better way. Towns of the type built earlier in this century – those compact, walkable communities where you could walk to the store and kids could walk to school, where there was a variety of housing types from housing over stores to single-family units with front porches facing tree-lined, narrow streets -these towns provided a life style that now seems far preferable to today’s neighborhoods. Thus we have seen an increasing interest in a number of concepts that would bring us back to a more traditional style of development and a style of planning that would be more in tune with nature including “neotraditional planning”, “sustainable development”, “transit-oriented design”, the “new urbanism”, and the concept of “livable” communities. In 1991, at the instigation of Local Government Commission staff-member Peter Katz, author of the New Urbanism, the commission brought together a group of architects who have been leaders in developing new notions of land use planning: Andres Duany and Elizabeth Plater-Zyberk, Stefanos Polyzoides and Elizabeth Moule, Peter Calthorpe, and Michael Corbett. These innovators were asked to come to agreement about what it is that the new planning ideas – from neotraditional planning to sustainable design- have in common and from there, to develop a set of community principles. They were then asked how each community should relate to the region, and to develop a set of regional principles. Finally, they were charged with defining how these ideas might be implemented by cities and counties. The architects’ ideas were drafted by attorney Steve Weissman into a form which would be useful to local elected officials and provide a vision for an alternative to urban sprawl. A preamble, topics of specific ideas, community principles, regional principles and implementation of the principles was presented in the fall of 1991 to about 100 local elected officials at a conference at the Ahwahnee Hotel in Yosemite. There they received both a highly enthusiastic response and their title- the Ahwahnee Principles. The community principles define a community where housing and all the things needed to meet the daily needs of residents are located within walking distance of one another. They call for returning to historic population densities around transit stops to provide the critical mass of people and activities in these areas needed to make transit economically viable. They call for housing which provides places to live for a variety of people within a single neighborhood instead of separating people by income level, age or family situation. The Ahwahnee Principles state that development should be compact but with open space provided in the form of squares or parks. Urban designer Michael Freedman describes this as space-making rather than space-occupying development. Rather than surrounding buildings in the center of unusable landscaped areas (space-occupying development), Freedman says we should use buildings to frame public space (place-making design). Freedman holds that to plan for more livable communities, local government officials must understand the human scale – that is, the basic relationship of people to the environment in which they live. In neighborhoods, for example, we must recognize the relationship of the house to the front door to the street. In doing so, we will create the sorts of places which bring people together and create a vitality, a sense of community. By framing open space with buildings which open onto it, there are more eyes to look upon the area and that creates places that feel more safe. And with that design solution comes more compact development – development which has less costly infrastructure requirements, and development which is more walkable and more easily served by transit. Further, the principles call for an end to the monotony of contiguous, look-alike building by separating each community with a well defined edge, such as an agricultural greenbelt or wildlife corridor, so that we can actually see where one community ends and another begins. From a transportation standpoint, one of the most important principles is that all parts of the community should be connected by streets or paths – no more dead end cul de sacs, fences, or walls which prevent us from going directly from one point to another. Narrow streets, rather than wide streets, are recommended because they help slow traffic and make it safer for pedestrians and bicycles. Narrow streets also create more attractive, more people-friendly neighborhoods and shopping districts. Finally, the community principles call for more resource-efficient land use planning – the preservation of the natural terrain, drainage and vegetation; and the use of natural drainage systems and drought tolerant landscaping and recycling. They ask that buildings be oriented properly, (as required by the California solar rights act) so that they can take advantage of the sun for heating and natural breezes for cooling. The regional principles call for the land-use planning structure to be integrated within a larger network built around transit rather than freeways, with regional institutions and services located in the urban core. A perfect example of this can be found in the City of San Jose where city planners chose to locate a new sports stadium in the downtown area, close to several rail stops rather than off a freeway. The surrounding restaurants and shops are benefiting from the increased number of passers-by before and after games, and freeway travel is not as clogged as it otherwise would have been. The architects noted that regions should be distinct from one another rather than fading into one another as they largely do today. Each region should be surrounded by a wildlife corridor or greenbelt and the materials and methods of construction should be specific to the region. Santa Barbara and Santa Fe come forward as two excellent examples of communities who have followed these principles and who have realized that there are economic as well as aesthetic advantages of doing so. Both of these cities have implemented strict design guidelines for their downtowns which preserve the historical architectural styles of their regions. Because these cities have retained a very special and distinct sense of place, they have become highly popular both as places to live and as tourist destinations. The implementation strategy forwarded by the planners is fairly straightforward and simple. First, the general plan should be updated to incorporate the Ahwahnee Principles. Next, local governments should take charge of the planning process rather than simply continuing to react to piecemeal proposals. Prior to any development, a specific plan or a precise plan should be prepared based on the planning principles. With the adoption of specific plans, complying projects can then proceed with minimal delay. The developer will know exactly what the community wants. There should be no more costly, time-consuming, guessing games. Finally, the architects put forth the most critical principle of all, “Plans should be developed through an open process and participants in the process should be provided visual models of all planning proposals.” Without involving citizens from every sector of the community, including developers, the political viability of a new plan may be limited. Citizens must be getting what they want and care enough to be vigilant about it so that the plan cannot be changed by a single property owner with a self interest. But the stability of planning policies is not the only advantage of citizen participation. Bringing together citizens to create a common vision for the community has more benefits than just the creation of a good plan that will be upheld through time. The process itself can create a sense of community and an understanding between previously warring factions. However, it is difficult for citizens to visualize what a new planning scheme is going to look like after it is built if they see only a one-dimensional sketch or read about the plan in a six-inch thick planning document. There are a number of techniques which have been developed to address this problem. The visual preference survey, where participants are provided an opportunity to express their likes and dislikes through judging slides, allows citizens to actually see concrete examples of their options. Another useful technique is computer simulation where the visual results of a physical plan can be created on the computer. Another method involves taking participants on a walk through their own town to determine which portions of the community look good and function well and which do not. The concepts embodied in the Ahwahnee Principles are being implemented by cities and counties throughout the nation, with most of the activity occurring on the east and west coasts. In Pasadena, the participation of 3,000 residents from all sectors of the community resulted in a general plan with a guiding principle which states, “Pasadena will be a city where people can circulate without cars.” The plan lays out where growth should occur – primarily along light rail stations and in neighborhood commercial areas within walking distance of residences. The city is now preparing specific plans to guide what that growth should look like. One of the projects, a mixed-use housing development near a downtown rail stop, is already complete. In San Jose, the City has produced, under the guidance of citizen advisory groups, a total of four specific plans for infill sites in various parts of the City covering a total of almost 1,000 acres. 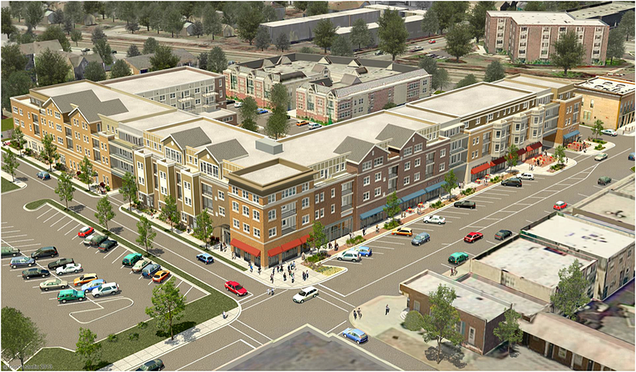 Their goal is to assure that new development will occur as compact, mixed use neighborhoods located near transit stops. The City of San Diego has adopted “Transit-Oriented Development Design Guidelines” for the purpose of redirecting existing patterns of building within the City and helping reduce the community’s dependence on the automobile. The planning staff has completed the first public review draft of a comprehensive zoning code update that will create zoning designations to implement the guidelines. In Sacramento, Walnut Creek, Santa Barbara and San Diego, city officials have broken new ground by siting new shopping malls downtown, near transit, rather than off a freeway. The benefits include both a new surge of economic activity for downtown businesses and a reduction in auto use and the associated negative air quality impacts. The California Air Resources Board has noted that over 60% of the people arriving at San Diego’s downtown mall, Horton Plaza, arrive via transit or walking. Developer-proposed, large-scale, new development is also reflecting the influence of the Ahwahnee Principles. The one-thousand acre, Playa Vista infill project in Los Angeles will include the preservation of 300 acres of wetlands. As it is designed now, the development will feature moderately-dense housing built small neighborhood parks. Large offices, small retail stores, restaurants, grocery stores and small telecommuting offices will be integrated, allowing residents to walk when they go to work, shop, or go out to dinner. A bicycle and pedestrian esplanade will link the town with the beach. Rialto’s Mayor John Longville is working with the developer of a 3,000 acre development near the Ontario airport to incorporate the concepts of the Ahwahnee Principles in that project. Even the US government has embraced the Ahwahnee Principles. Architect Peter Calthorpe reports that the planning concepts outlined by the Ahwahnee Principles have been written into a guidance document recently published the federal government. Calthorpe was a coauthor of the document, Vision/Reality produced by the US Department of Housing and Urban Development for local government officials interested in applying for Community Development Block Grant program and other funds. A number of city planners believe that if they can just solve the problem of traffic, they can solve the major problems of their cities. Yet the simple needs of the automobile are far more easily understood and accommodated that the complex needs of people. The Ahwahnee Principles outline a set of ideas for planning more livable communities built for people, not just cars, and provide a vision for an alternative to urban sprawl. This new vision will lead to neighborhoods where people no longer live in a house with an isolated rear yard. They will live in a home with a comfortable relationship to the street which is part of a neighborhood. Tree-lined sidewalks with narrow streets will induce cars to drive more slowly. Children will be more safe when they play in the neighborhood and the sense of community will add a feeling of security. When they need to go to school, to the store, or to baseball practice, children will be able to walk or ride a bike rather than being dependent on someone driving them there. The top down, traditional planning of yesterday is no longer an acceptable means of making cities. The people served must be involved. When people come together and openly discuss their visions for the future, a sense of community will result. Bringing citizens into the process of developing and revising the general plan will also result in new development which both serves the needs of the community and is used and respected by the residents it serves. To make better, more livable cities, local governments must take charge of the process of planning while involving and utilizing its bet asset, the people who work, live and play in our communities. The architects who gathered in 1991 to develop the Ahwahnee Principles are all internationally known for their inspirational work and innovative ideas. Peter Calthorpe, is one of the leaders of the “New Urbanism” movement and was cited by Newsweek Magazine as “one of 25 innovators on the cutting edge.” Michael Corbett, a former Mayor of the City of Davis, has received international recognition for his design of the resource-efficient Village Homes development in Davis, a project often cited as the best existing example of sustainable development in the world. The husband-wife team of Andres Duany and Elizabeth Plater-Zyberk, made headlines with their wildly successful Seaside development in Florida and have become highly acclaimed architects and planners of neotraditional communities. Stefanos Polyzoides is an associate professor of architecture at the University of Southern California. He and his partner, Elizabeth Moule, are the architects of Playa Vista in Los Angeles, a model application of the Ahwahnee Principles. Authors/Editors: Peter Calthorpe, Peter Katz, Michael Corbett, Judy Corbett, Andres Duany, Steve Weissman, Elizabeth Moule, Elizabeth Plater-Zyberk, Stefanos Polyzoides. The U.S. Department of Transportation (DOT) has been working to address nonmotorized safety issues nationwide and help communities create safer, better-connected bicycling and walking networks as part of the Department’s Safer People, Safer Streets Initiative. Since launching the Safer People, Safer Streets Initiative in 2014, DOT has engaged safety experts, existing and new stakeholders, local officials, and the public on a range of targeted strategies to encourage safety for bicyclists and pedestrians on and around our streets, including bus stops, transit stations, and other multimodal connections. Through these discussions, a number of common misconceptions have been raised about the use of Federal funding, street design, and the Environmental Review process that can cause confusion and result in project delay. The information below addresses these common misconceptions and distinguishes between Federal standards and State and local practice. Where possible, links identify resources that provide more detail on the topic. This document focuses on three policy areas: Funding, Design, and Environmental Review. 1. The Transportation Alternatives Program (TAP) is the only Federal funding source for pedestrian and bicycle projects. This is false. While TAP is a popular source of funding for bicycle and pedestrian infrastructure, pedestrian and bicycle projects are eligible for many programs through the Federal Highway Administration (FHWA) and Federal Transit Administration (FTA). At FHWA, pedestrian and bicycle projects are eligible for funding through the Congestion Mitigation and Air Quality Improvement (CMAQ) Program, Surface Transportation Program (STP), Highway Safety Improvement Program (HSIP), National Highway Performance Program (NHPP), Federal Lands and Tribal Transportation Programs (FLTTP), and TAP. The FTA funding may also be available through Capital Funds and Associated Transit Improvement. Each of these programs has different requirements, so to be eligible, the pedestrian and bicycle project must meet the program’s requirements in order to receive funding. For example, transit funds may be used to improve bike lanes and sidewalks as long as they provide direct access to transit; CMAQ funds must be used for projects that benefit air quality; HSIP projects must be consistent with the State Strategic Highway Safety Plan and address a highway safety problem; NHPP-funded projects must benefit National Highway System (NHS) corridors; and FLTTP funds could be used for bicycle and pedestrian accommodations that provide access to or within Federal or tribal lands. Often bicycle and pedestrian elements are included in much larger roadway or station-area projects that are funded through each of these programs. For example, pedestrian and bicycle facilities may be included on rehabilitated, reconstructed, or new bridge structures to improve the network. The FHWA division offices can assist in determining options for using multiple funding sources to fund one project. Funding is also available for non-infrastructure projects. For instance, the National Highway Traffic Safety Administration (NHTSA) provides funding for behavioral safety aspects, education, and enforcement, in coordination with the State’s highway safety office. 2. Federal transportation funds cannot be used to enhance the local roadway network. This is false. The FHWA guidelines allow NHS capacity and safety needs to be addressed through a mix of on-system and parallel system network streets. A portion of the local network is part of the Federal-aid highway system. All other roads that have a functional classification higher than local road or rural minor collector are eligible for Federal-aid funding through STP. Projects on local roads and rural minor collectors may be eligible in some cases. Furthermore, STP, TAP, and HSIP funds may be used for bicycle and pedestrian projects along any public road or trail, without any location restriction. 3. Separated bike lanes cannot be built with Federal funds. This is false. Federal funds can be used to plan and build separated bike lanes, which can include cycle tracks and protected bike lanes. The FHWA recently published a Separated Bike Lane Planning and Design Guide, which includes planning considerations and design options for separated bike lanes. In addition, separated bike lanes are included in the Bicycle and Pedestrian Funding Opportunities: US Department of Transportation, Federal Transit, and Federal Highway Table. 4. Federal funds can’t be used for road diets. This is false. Federal funds may be used for road diets, which are generally described as removing vehicle lanes from a roadway and reallocating the extra space for other uses or traveling modes, such as parking, sidewalks, bicycle lanes, transit use, turn lanes, medians, or pedestrian refuge islands. The FHWA supports consideration of road diets or rightsizing when applied at the proper location and has created a webpage to promote the use of this technique. Road diets can offer significant safety benefits to a community (20-60% reduction in crashes is common) and are one of FHWA’s Proven Safety Countermeasures being promoted through the FHWA Every Day Counts 3 Initiative. Additionally, in many applications, they are part of city and regionally approved pedestrian and bicycle master plans, and community comprehensive master plans. Localities across the nation are using this low-cost safety countermeasure to improve safety, operations, and livability in their communities. 5. Nonmotorized projects cannot compete effectively for CMAQ funding. This is false. States have funded more than $1.5 billion in bicycle and pedestrian accommodations with CMAQ Program funds since 1993. The CMAQ Program is intended to be a flexible funding source to State and local governments for transportation projects and programs to help meet the requirements of the Clean Air Act. Funding is available to reduce congestion and improve air quality for areas that do not meet the National Ambient Air Quality Standards for ozone, carbon monoxide, or particulate matter (nonattainment areas) and for former nonattainment areas that are now in compliance (maintenance areas). Funds may be used for transportation projects likely to contribute to the attainment or maintenance of a national ambient air quality standard, with a high level of effectiveness in reducing air pollution. The CMAQ funding is apportioned to the States to support projects that meet specific eligibility criteria. Some locations give preference to CMAQ eligible quality of life projects, such as nonmotorized transportation projects, as part of their CMAQ funding criteria. See for example the Merced County Association of Governments’ Goals and Procedures for Programming CMAQ Funds: http://www.mcagov.org/DocumentCenter/View/188. 6. The only design standard that can be used on Federal-aid highway projects is the AASHTO A Policy on Geometric Design of Highways and Streets (Green Book). This is false. The FHWA adopted the American Association of State Highway and Transportation Officials (AASHTO) Green Book as the design standard for projects on the NHS, other than projects on the Interstate highway system, regardless of funding source (23 CFR 625). States may adopt their own standards for non-NHS projects (23 CFR 625.3(a)(2)). The Green Book provides flexibility in design. When a Green Book standard applies but an element of the design is outside the Green Book parameters, a design exception may be considered in accordance with 23 CFR 625.3(f). Part 9 of the Manual on Uniform Traffic Control Devices for Streets and Highways (MUTCD) is dedicated to traffic control on bicycle facilities. Compliance with the MUTCD on facilities open to public travel is required regardless of funding source, in accordance with 23 CFR 655. In addition to the flexibility the MUTCD provides through Guidance and Option provisions, the MUTCD also contains a mechanism for experimenting with novel traffic control devices (Section 1A.10). Note that some of the traffic control treatments shown in the external resources referenced herein might still be subject to the experimentation process under the MUTCD. The FHWA’s 2013 Bicycle and Pedestrian Design Flexibility Memo supports a flexible approach to the planning and design of pedestrian and bicycle facilities. This memo indicates that FHWA supports the use of additional resources that build off the flexibilities provided in the AASHTO Guide for the Planning, Design, and Operation of Pedestrian Facilities and the Guide for the Development of Bicycle Facilities, as well as the policy based Green Book. These resources include the National Association of City Transportation Officials’ Urban Bikeway Design Guide and the Institute of Transportation Engineers’ Designing Walkable Urban Thoroughfares. FHWA also recently published the Separated Bike Lane Planning and Design Guide that includes planning considerations and design options for separated bike lanes. 7. 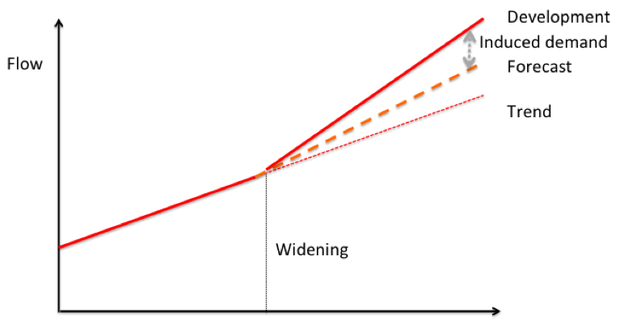 Lane widths cannot drop below 11′ on the NHS and 9′ when Federal funds are used on local roads. This is false. There is no minimum lane width requirement to be eligible for Federal funding. As stated in the answer to Question 6, States may adopt their own standards for non-NHS roadways. The NHS includes major arterials as well as other roads important to the nation’s economy, defense, and mobility. As such, the Green Book generally requires 11′ or 12′ lanes on these roads. The Green Book allows for lesser lane widths on low-speed facilities and low-volume roads in rural and residential areas; situations in which research shows that narrower lanes should not negatively impact safety if appropriately implemented based on the context. There is no outright prohibition against using lane widths less than those stated in the Green Book, if a design exception is justified and approved in accordance with FHWA regulations and policy. For more information on design standards and design exceptions, please visit http://www.fhwa.dot.gov/design/standards/qa.cfm. In appropriate contexts, narrower lanes, combined with other features associated with them, can be marginally safer than wider lanes. The FHWA supports the use of sound engineering judgment in design. The FHWA frames this discussion using the terms nominal safety versus substantive safety. Nominal safety means a design meets the technical standards; substantive safety means that a design will achieve low crash rates relative to expectations. 8. Curb extensions, trees, and roundabouts cannot be used on the NHS. This is false. There is no prohibition on incorporating these features on NHS projects. Curb extensions, also known as bulbouts or neckdowns, can have significant benefits for pedestrian safety. Curb extensions are explicitly supported by FHWA because they enhance the safety of pedestrians, reduce the distance needed to cross the street, and make pedestrians more visible to motorists, particularly when there are parked cars in the vicinity. The related use of medians and crossing islands are FHWA Proven Safety Countermeasures. The suggested AASHTO clear zone distances will vary based on a number of factors such as speed, traffic volume, roadside grading, and horizontal curvature. On higher speed, higher volume roadways, certain roadside features might need to be located farther from the roadway. According to FHWA’s Roundabouts: An Informational Guide, roundabouts can be considered for a variety of reasons from community enhancement and traffic calming to safety improvements and operational benefits. In fact, roundabouts are one of FHWA’s Proven Safety Countermeasures. 9. Speed limits must be set using the 85th percentile methodology. This is false. The MUTCD Section 2B.13 contains the following mandatory (Standard) statement: “Speed zones (other than statutory speed limits) shall only be established on the basis of an engineering study that has been performed in accordance with traffic engineering practices.” According to the 2012 FHWA Document Methods and Practices for Setting Speed Limits, there are basic ways of setting speed limits. Use of the 85th percentile methodology is just one part of what FHWA calls the Engineering Approach. This is described as “A two-step process where a base speed limit is set according to the 85th percentile speed, the design speed for the road, or other criterion. This base speed limit is adjusted according to traffic and infrastructure conditions such as pedestrian use, median presence, etc.” The 2012 document goes on to say that the engineering approach requires the use of judgment. This is different than simply setting a speed limit based on the measured 85th percentile. The FHWA developed a model called USLIMITS2, which is a web-based tool using an expert system with a fact-based set of decision rules to determine an appropriate speed limit for all roadway users. For roadway segments that experience high pedestrian and bicyclist activities, USLIMITS2 recommends speed limits close to 50th percentile instead of 85th percentile speed. For more information, visit http://safety.fhwa.dot.gov/uslimits/. 10. Bicycle and pedestrian projects must be within the existing Right of Way (ROW) to be eligible for a Categorical Exclusion. This is false. As with all roadway projects, FHWA regulations do not require bicycle or pedestrian facilities to be within the existing ROW to be eligible for a Categorical Exclusion. See 23 CFR 771.117(c). The environmental review process for the National Environmental Policy Act (NEPA) considers environmental impacts of a proposed project, and does not mandate the siting of a project either within or outside of existing rights-of-way. Often an existing highway right-of-way has been disturbed to a point where it may be unlikely that a bicycle or pedestrian project would result in important impacts. This may or may not be true for proposing a project that includes locations outside of existing rights-of-way. If significant impacts result from a project, whether situated entirely within or including some areas outside existing rights-of-way, a categorical exclusion may not be appropriate, and an Environmental Assessment (EA) or Environmental Impact Statement (EIS) would need to be prepared instead. Great universities, venture capital, and talented people are necessary, but insufficient. But as Silicon Valley’s own Paul Graham has pointed out, the actual formula is far more complicated. Truly entrepreneurial places like Silicon Valley have a distinct personality—Graham likes to refer to it as “a place that tolerates oddness”—that is central to their economic success. A new study by the personality psychologists Sam Gosling and Jason Rentfrow (with whom I have collaborated before), the economist David Audretsch, and others seeks to understand how this notion of an entrepreneurial personality affects a city’s ability to innovate and create new companies. The study advances the basic idea that resources such as great universities, venture capital, and talented people are necessary, though insufficient conditions to power high levels of regional innovation by themselves. The missing factor is the entrepreneurial culture (an environment that fosters entrepreneurship) or entrepreneurial personality of a place, a combination of specific traits made up of the Five-Factor Theory of Personality: high levels of openness combined with extraversion and conscientiousness. In other words, entrepreneurs have the drive and resilience to overcome obstacles, are more open to new ideas, and are able to connect with people, build and lead teams, and get things done. Talent and knowledge alone, while important, are not enough to generate high levels of entrepreneurship. To get at this “culture of openness and curiosity,” the researchers combine data from their own large-scale, internet-based studies of personality in the United States and Great Britain with data on regional entrepreneurship and a wide variety of control variables for these two countries. This includes detailed personality surveys, collected in collaboration with the BBC, of nearly 940,000 subjects in the U.S. and more than 400,000 in Britain. The researchers aggregated the data on individual personality traits to score regions on their entrepreneurial personality or entrepreneurial culture. They examine the effect of this entrepreneurial personality on regional rates of overall startups per capita, as well as high-growth startups, for both countries. They also control for factors like unemployment, absolute level of income, change of income over time, migration, and residents age 25-44 who are more likely to be involved in entrepreneurial pursuits. 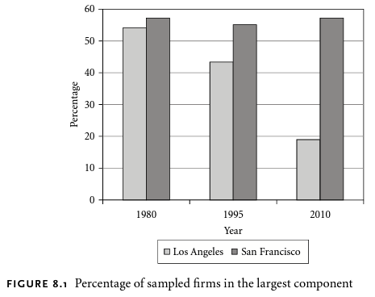 The researchers then chart their findings (on the maps below) for both entrepreneurial personality and startup rates for regions in the U.S. (Figure A charts the entrepreneurship rate, Figure B looks at human capital and entrepreneurial culture, and Figure C maps industry diversity and entrepreneurial culture.) For Figures B and C, regions in white are below the median values, regions in dark blue are above the median values, and regions in light blue are above the median values for just one variable. As the maps show, the places with high values across the board are located on the West Coast of the U.S., parts of the Rocky Mountains, and Florida. Regions in the South and Midwest tend to exhibit low knowledge rates and a low entrepreneurial culture, as well as low entrepreneurship rates. Their maps for Great Britain (below) are a bit more complicated, but still display high levels of knowledge, entrepreneurial culture, and high entrepreneurship rates in London and regions in the South East. In contrast, many regions in Wales, Scotland, and the East of England have low values across the board. Ultimately, the study finds that regions in the United States with high levels of entrepreneurial culture and knowledge have entrepreneurship rates that are 18 percent greater than regions with high levels of knowledge but a low entrepreneurial culture. These differences are even more pronounced for Great Britain, where regions with high levels of knowledge and high entrepreneurial culture have entrepreneurship rates that are 35 percent higher. The study’s statistical models find that the combination of entrepreneurial culture, local knowledge, and talent account for more than 60 percent of the total variation in entrepreneurship rates across regions in the two countries. While the study cannot prove causation (What comes first, entrepreneurial personality or more startups? ), it shows that talent and knowledge alone, while important, are not enough to generate high levels of entrepreneurship. It is the distinct “entrepreneurial culture” of a region, the combination of culture and knowledge, which facilitates entrepreneurial success. So take heed, mayors and business leaders: It will take a lot more than establishing tech transfer programs at research universities, upping the amount of local venture capital, or creating new incubators to encourage entrepreneurship. Deep down, it’s also about attracting the right kinds of people and boosting a location’s entrepreneurial mindset. It’s actually hard to know what to believe about millennials, the Americans born after 1980 who make up the largest generation in history. Every week there’s a new ground-shattering revelation about their lifestyles—but the most conflicting reports have to do with where they live. Over the last few years, across the country—around the world, too—people of all ages, including millennials, have been moving into cities at an astonishing rate. Now more than half of the world’s population is urban. So here’s the big question: Are today’s 20- and 30-somethings really going to live more urban lifestyles than Gen Xers or Boomers? Or are they going to eventually vacate cities for the ‘burbs, just like every generation before them? Then came some interesting data, pegged to the release of 2014 Census information this spring: Millennials have indeed started moving out of big city downtowns—but not necessarily in favor of a quiet rural or suburban life. Instead, we’re seeing a brand new trend: Thanks to the generation’s size and influence, millennials are moving to new places made just for them, by them—revitalizing smaller cities or opting for hybridized urban-burb enclaves where quality of life is the driving force. As the first wave of millennials started to take jobs, it seemed that this generation was dedicated to living and working downtown. According to different studies, millennials were prioritizing dense neighborhoods, helping to fuel the biking boom, even—whoa!—refusing to get their driver’s licenses. Companies luring millennials promoted their downtown locations with transit proximity, bike-commuting amenities, and other perks which aligned with these lifestyles. But it turns out that many millennials weren’t ever planning on settling in cities for good—they were just putting off the move to the suburbs for a few more years. A report in May discovered that fund managers are betting on millennial ‘burb living by investing in car companies and single-family home builders. “Especially in the older millennials, we’re seeing a move towards more traditional patterns, just on a delayed time frame,” Sarah House, an economist at Wells Fargo, told Reuters. But it’s not only about following “traditional” patterns, it’s also about being priced out of an insanely expensive housing market. 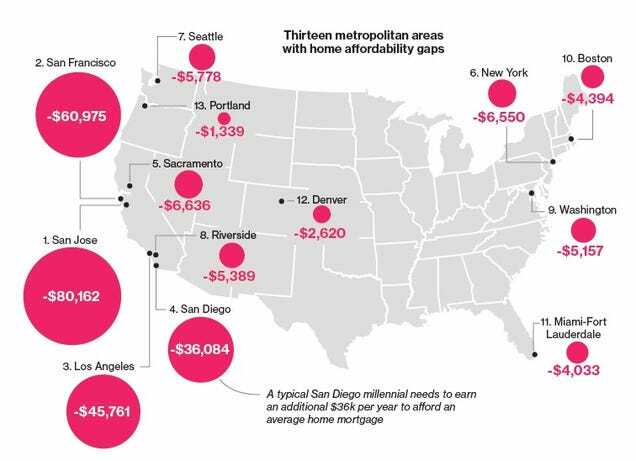 Last month, Bloomberg crunched the most recent US Census data and came up with the Millennial Housing Affordability Index, declaring 13 cities completely unaffordable for home ownership based on estimated earnings for the millennials living there. What’s happening with millennials and cities is really just part of a larger issue around the rising cost of housing that’s pricing out plenty of people in already-expensive cities. Of course moving into a city is going to be extra-unattainable, financially, for someone just starting out in their career. Maybe millennials are actually way smarter than everyone else for not staying in places they can’t realistically afford. But it turns out that millennials are different in the sense that they’re coming up with innovative ideas for how to live well wherever they are—which sometimes means bringing the urban experience with them. According to a recent study by the Urban Land Institute, “Gen Y and Housing: What They Want and Where They Want It,” a nationwide survey of millennials aged 19 to 36 showed that most of them were never living the glamorous downtown life that most stories like to describe. Only 13 percent of millennials in the survey lived in or near downtowns—the rest lived in other city neighborhoods—or in the suburbs. The kinds of places that millennials want to live share a lot of the same characteristics with urban centers—they’re looking for amenities like walkability and public transit. But according to the study, it’s more about relationships and having the time to enjoy those relationships, which doesn’t necessarily mean working long hours to pay the rent in a big city. Chicago has always been a haven for young professionals. Its suburbs are also some of the most famous in the country, a sprawling bedroom community that ripples out from the urban core. But just like the way that Chicago’s inner city is focusing on making a lot of the changes that supposedly attract those young professionals—improving public spaces, redesigning pedestrian connections, and building more biking infrastructure—its suburbs are undergoing their own renaissance, too. For example, in Wilmette, a town that’s historically limited rentals, the village board preliminarily approved a plan in May to build a 75-unit luxury apartment building with ground-floor stores on Green Bay Road, across from the Metra station. Units will average about $2,250 a month for 1,000 square feet. The village courted the project in concert with its master plan, which in 2014 raised height limits downtown from three to five stories. These kinds of compact, livable communities that crop up in less-dense areas have all sorts of names, like New Urbanism and “walkable urban places,” but the one that’s stuck recently is “urban burbs”—and the urban burbs are a new kind of hybridized place made just for millennials. Millennials might not be staying in the urban cores, but rather, they’re helping to remake the urban-like enclaves that allow easy access to the city when they want it. These places where millennials are choosing to live still have the qualities of downtowns—dense housing, transit connections, walkability, good food, great bars—without the high prices of downtowns. I wanted to know if any of this rang true to actual millennials. So I talked to participants of the Millennial Trains Project, a nonprofit which selects a group of millennial entrepreneurs to travel across the country on an Amtrak train, stopping in cities along the way to meet with civic-minded startups. Each of the participants are required to crowdfund $5000 to pay for their own participation on the trip, and many end up forming relationships which spin off into new urban-minded projects. There seemed to be a different trend for millennial living that was well-represented by the group. Instead of settling in big, expensive urban centers like New York, San Francisco, and Los Angeles, many of these millennials were leaving to look for opportunities in smaller cities. 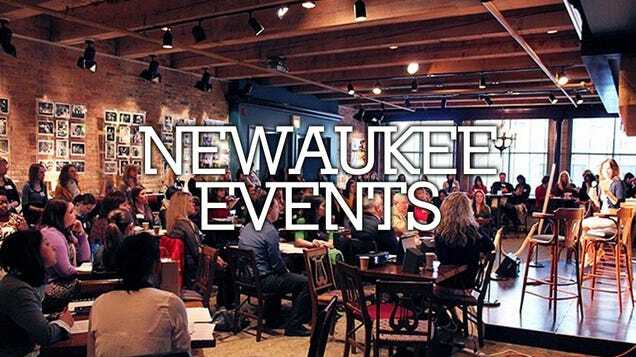 Nicole Behnke is 24 and works at what she calls a “social architecture agency” in Milwaukee called NEWaukee, where she organizes events for young professionals. She has a car, although she doesn’t like to drive it. She has noticed some of her friends moving out into suburbs, but that’s not what she personally wanted out of a living situation: She recently closed on a condo in downtown Milwaukee. For her, the choice to live in Milwaukee instead of, say, Chicago, or even its urban burbs, came down to more than just price (although that was a big factor). While visiting San Antonio during the Millennial Trains adventure—a place she had always perceived to be in the shadow of Austin—she saw the incredible opportunity offered by her move to Milwaukee. She realized that moving to a smaller city was allowing her to help shape a community. After traveling to so many cities and seeing this generation in action, Behnke believes that millennials want to be invested in where they live in a way that their parents were not. Whether it’s driving changes in the suburbs or revitalizing a smaller city, 79 million Americans who want to make their communities even a little bit better is a very good thing for the country—and there might not be a better legacy for any generation in history. Oxnard – Becoming the World Class city it deserves to be! Oxnard is no longer a sleepy little agricultural town – we are 200,000+ strong and growing every day. Oxnard is the largest city in Ventura County by far, and it’s time for Oxnard to grow up – to become the World Class city it deserves to be. It’s time for Oxnard to become the urban center of the County – leading in innovative housing & 21st century manufacturing – with a vital and flourishing downtown and Main Street. Oxnard has a significant small-scale manufacturing and light industry sector that needs local resources including better education and housing for our residents to thrive. Housing that is innovative, compact, multi-story, and mixed-use, with choices for all people, along the Oxnard Boulevard corridor and a walkable Main Street will go along way to shift Oxnard towards civic pride and that World Class reality. Big-box retailers’ new tactic to slash their taxes is the latest example of why cities are better off saying no to the boxes and cultivating Main Streets instead. In February, the library in Marquette, Mich., announced that it was cutting its hours. It wasn’t that its Sunday programming was any less popular, or that it had gotten the short end of the stick in next year’s budget planning. Instead, thanks to a new method that big-box stores are using to game the tax system, Marquette owed a $755,828.71 tax refund to the home improvement chain Lowe’s. Essential services like the library, the school district, and the fire department were on the hook to pay for it. The Peter White Public Library would now be closed on Sundays. Marquette is one of the countless towns that has bought into big-box economic development. Over the years, the town in the Upper Peninsula of Michigan spent millions extending water mains, law enforcement, and other infrastructure and services to its big-box commercial corridor along U.S. 41. When the Lowe’s opened there in 2008, local officials including the mayor turned out for a “board-cutting” ceremony—the home improvement center version of a ribbon-cutting. Then, less than two years later, Lowe’s flipped the script. The mega-retailer, which reports annual net sales of about $50 billion, went to tax court to appeal its property tax appraisal. Marquette had pegged the taxable value of the store, which had just been built for $10 million, at $5.2 million. In front of the Michigan Tax Tribunal, an administrative court whose members are appointed by the state governor, Lowe’s won assessments that were, instead, $2.4 million in 2010, $2 million in 2011, and $1.5 million in 2012. What was worse was the methodology that Lowe’s, and the tax tribunal, had used to arrive at the lower figures. Figuring out the value of a property can be a complicated business. In Michigan, town and county assessors typically use a property’s construction costs, minus depreciation, as a primary metric to determine its fair market value; taxable value is half that amount. Property owners sometimes prefer, instead, to use the sale prices of comparable properties. This was the approach that Lowe’s took—with a catch. Lowe’s looked at the definition of the word “comparable,” and decided to stretch it. It said that, because big-box stores are designed to be functionally obsolescent, the only comparable stores are those that have been closed and are sitting empty—the “dark stores” behind this method’s name. It’s an established part of the big-box retail model that the boxes themselves be custom-built, cheaply constructed, and disposable. If retailers decide that they need a bigger space, it’s cheaper for them to leave the old one behind and build a new one. When Walmart, for instance, opened its wave of new, twice-the-size Supercenters across the country in 2007, it left hundreds of vacant stores behind it. This means that new, successful stores like the Marquette Lowe’s are rarely the locations that are up for sale, and that when big-box stores do come on the market, it’s because they’ve already failed or been abandoned by the retailer that built them. In other words, Lowe’s was saying, it had built a property that, despite generating roughly $30 million in annual sales for the company, had very little value, and because of that, it should get a break in its property taxes. One of the comparables used by Lowe’s, for instance, was a big-box store that, because of deed restrictions that kept out retail, had been partially converted into a go-kart track—a much less valuable use for that property. Marquette appealed the ruling, but the Michigan Court of Appeals sided with the tax tribunal, and in Dec. 2014, the Michigan Supreme Court announced that it would not hear the case. Now, following the lead of Lowe’s, about 12 other large retail chains in Marquette have appealed their own assessments to the Michigan Tax Tribunal. These cases don’t just affect property tax revenue going forward, but can also force towns to rebate taxes already paid. So far, Marquette has had to refund over $1.5 million in taxes, money that it had already collected, allocated, and spent. The tribunal appears “likely” to rule in favor of the remaining cases, reports WNMU Public Radio. If that happens, the public services that are funded with tax dollars would have to refund big-box chains as much as $1.9 million in 2015. “This could spread like wildfire,” State Rep. John Kivela told the radio station. It already is. In Ottawa County, Mich., for instance, big-box stores have lowered their assessments by $14.8 million. Statewide, in the last three years alone, the reduction in property taxes as stores bring appeals based on the “dark store” method has been $47 million, according to the Michigan Association of Counties. Once that revenue stream is lost, it’s lost for good. A Michigan law known as Proposal A dictates that, barring major changes to a property, increases in the taxable value of that property are capped at either 5 percent or the rate of inflation. Michigan assessors are now fielding calls from officials in other states concerned about the same thing happening to them. Already, the dark store approach has struck across the border, in Indiana. After winning assessments in Michigan, the chain retailer Meijer brought a case at one of its most successful Indiana locations, and argued that the thriving store should be valued based on a shuttered Lowe’s and three abandoned Walmarts. Meijer got its store’s assessment slashed from $83 per square foot to $30 per square foot, and litigated the case retroactively, so that it extended back over a nine-year period. Now Marion County, where the store is located, is facing a refund of $2.4 million to Meijer. If the dark store method becomes the norm in the state, a study commissioned by Indiana county officials found, the value of more than 17,000 commercial properties would drop by $3.5 billion. Their big-box retail owners would shift a tax burden of $120 million onto other types of taxpayers, like locally owned stores and working families. While the dark store method is just catching fire in Michigan and Indiana, it’s part of a broader tax-cutting strategy that’s a familiar page in the big-box retail playbook. There’s also the other side of a local government’s ledger. Big-box retail is expensive to maintain. Because these stores are located outside of town centers and designed for car culture, they require local governments to extend and bolster public services and infrastructure like sewers, roads, and police forces. They also rely on these services heavily. When eight communities in central Ohio looked at the fiscal impacts of big-box retail, they found that the stores actually demanded more public services than they generated in revenue, and created a drain on municipal budgets to the tune of a net annual loss of $0.44 per square foot, or about $80,000 for a typical Walmart supercenter. Higher demand for police departments is one example. In Port Richey, Fla., nearly half of the town’s crime emanates from the area Walmart. “The taxes that come from Walmart are not even enough to cover two police officers’ salaries,” Police Chief Robert Lovering told Vice. In an Indianapolis suburb, the number of police calls to Walmart have led the mayor to declare the store a public nuisance. “They’re draining our resources every single day,” he told the Indianapolis Star. These are not one-off examples. A 2014 study found that when Walmart located in a community, its reduction in crime slowed. And once these stores are vacant, they continue as magnets for crime and vandalism, lowering nearby property values. Despite all of this, cities and towns continue to buy into the myth, sold to them by the mega-retailers themselves, that big-box stores spark economic development. In service of this myth, local and state governments across the country have granted at least $2.6 billion in subsidies to just six large retailers, including $160 million to Walmart and $138 million to Lowe’s, according to another study from Good Jobs First. That’s without factoring in the cost of services, which as Marquette, Mich., saw, can pile up. If towns and cities looked beyond the conventional wisdom that the big corporations have peddled, they’d see that there’s an alternative to big-box retail. It’s a familiar option: Instead of courting chain stores that lack a stake in their communities, cities and towns can cultivate locally owned, independent business. Locally owned retailers provide value to a community in many ways, but one of them is to the municipal accounting books. In a study that found that big-box retail generates a net deficit for taxpayers in a Massachusetts town, the researchers also discovered that specialty retail, like Main Street businesses, are the ones with a positive impact on public coffers, generating more revenue than they require to service. Then there are the buildings that these businesses occupy. Unlike the massive, windowless buildings preferred by big-box retailers, locally owned businesses tend to locate in walkable downtowns, inside of dense and often mixed-use buildings that have a history of being adapted for many different purposes. Back in Michigan and Indiana, communities are catching on. In Marquette, some residents have organized a boycott of the Lowe’s, and two state legislators from the area are working on a bill that will address the issue. Indiana has gone a step further. After the Meijer store ruling, state legislators quickly authored a bill to head off other cases. “Using empty stores might fit the letter of the law, but to a reasonable person, that’s not what’s intended by a comparable sale,” says state Sen. Pete Miller, one of the bill’s authors. The policy, which was signed into law in May 2015, sets firmer guidelines for how to value big-box properties. New properties, or those less than 10 years old, should be valued using the cost approach, the bill says. Further, in cases where comparable sales are used, the comparables cannot be properties that have been sitting vacant for more than one year, or properties with deed restrictions, among other measures. “We’re trying to get the balance right,” says Sen. Miller. Policies like this are essential for protecting towns and cities from the tax-gaming strategies of big-box retailers. Yet, the harrowing stories out of Michigan and Indiana also serve as a reminder of the deeper problems with big-box retail, and of how much smarter it is for communities to build durable places and stake their future on businesses that are owned locally. It may take longer than 10 years, but the editor does not think by much. We can no longer mandate excessive parking for new development. How Uber’s Autonomous Cars Will Destroy 10 Million Jobs and Reshape the Economy by 2025. I have spent quite a bit of time lately thinking about autonomous cars, and I wanted to summarize my current thoughts and predictions. Most people – experts included – seem to think that the transition to driverless vehicles will come slowly over the coming few decades, and that large hurdles exist for widespread adoption. I believe that this is significant underestimation. Autonomous cars will be commonplace by 2025 and have a near monopoly by 2030, and the sweeping change they bring will eclipse every other innovation our society has experienced. They will cause unprecedented job loss and a fundamental restructuring of our economy, solve large portions of our environmental problems, prevent tens of thousands of deaths per year, save millions of hours with increased productivity, and create entire new industries that we cannot even imagine from our current vantage point. The transition is already beginning to happen. Elon Musk, Tesla Motor’s CEO, says that their 2015 models will be able to self-drive 90 percent of the time.1 And the major automakers aren’t far behind – according to Bloomberg News, GM’s 2017 models will feature “technology that takes control of steering, acceleration and braking at highway speeds of 70 miles per hour or in stop-and-go congested traffic.”2 Both Google3 and Tesla4 predict that fully-autonomous cars – what Musk describes as “true autonomous driving where you could literally get in the car, go to sleep and wake up at your destination” – will be available to the public by 2020. Industry experts think that consumers will be slow to purchase autonomous cars – while this may be true, it is a mistake to assume that this will impede the transition. Morgan Stanley’s research shows that cars are driven just 4% of the time,5 which is an astonishing waste considering that the average cost of car ownership is nearly $9,000 per year.6 Next to a house, an automobile is the second most expensive asset that most people will ever buy – it is no surprise that ride sharing services like Uber and car sharing services like Zipcar are quickly gaining popularity as an alternative to car ownership. It is now more economical to use a ride sharing service if you live in a city and drive less than 10,000 miles per year.7 The impact on private car ownership is enormous: a UC-Berkeley study showed that vehicle ownership among car sharing users was cut in half.8 The car purchasers of the future will not be you and me – cars will be purchased and operated by ride sharing and car sharing companies. A Columbia University study suggested that with a fleet of just 9,000 autonomous cars, Uber could replace every taxi cab in New York City13 – passengers would wait an average of 36 seconds for a ride that costs about $0.50 per mile.14 Such convenience and low cost will make car ownership inconceivable, and autonomous, on-demand taxis – the ‘transportation cloud’ – will quickly become dominant form of transportation – displacing far more than just car ownership, it will take the majority of users away from public transportation as well. With their $41 billion valuation,15 replacing all 171,000 taxis16 in the United States is well within the realm of feasibility – at a cost of $25,000 per car, the rollout would cost a mere $4.3 billion. Disruptive innovation does not take kindly to entrenched competitors – like Blockbuster, Barnes and Noble, Polaroid, and dozens more like them, it is unlikely that major automakers like General Motors, Ford, and Toyota will survive the leap. They are geared to produce millions of cars in dozens of different varieties to cater to individual taste and have far too much overhead to sustain such a dramatic decrease in sales. I think that most will be bankrupt by 2030, while startup automakers like Tesla will thrive on a smaller number of fleet sales to operators like Uber by offering standardized models with fewer options. Ancillary industries such as the $198 billion automobile insurance market,18 $98 billion automotive finance market,19 $100 billion parking industry,20 and the $300 billion automotive aftermarket21 will collapse as demand for their services evaporates. We will see the obsolescence of rental car companies, public transportation systems, and, good riddance, parking and speeding tickets. But we will see the transformation of far more than just consumer transportation: self-driving semis, buses, earth movers, and delivery trucks will obviate the need for professional drivers and the support industries that surround them. The Bureau of Labor Statistics lists that 884,000 people are employed in motor vehicles and parts manufacturing, and an additional 3.02 million in the dealer and maintenance network.22 Truck, bus, delivery, and taxi drivers account for nearly 6 million professional driving jobs. Virtually all of these 10 million jobs will be eliminated within 10-15 years, and this list is by no means exhaustive. But despite the job loss and wholesale destruction of industries, eliminating the needs for car ownership will yield over $1 trillion in additional disposable income – and that is going to usher in an era of unprecedented efficiency, innovation, and job creation. 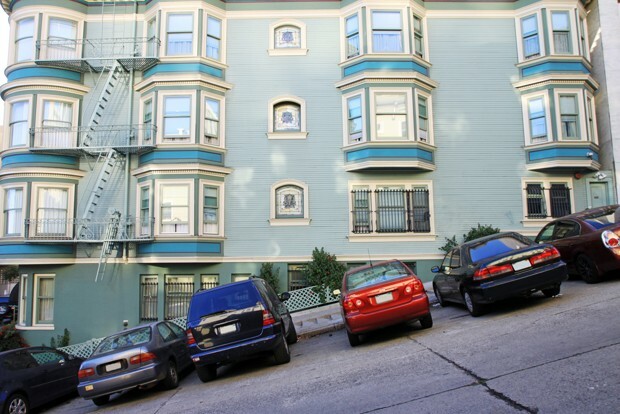 Morgan Stanley estimates that a 90% reduction in crashes would save nearly 30,000 lives and prevent 2.12 million injuries annually.23 Driverless cars do not need to park – vehicles cruising the street looking for parking spots account for an astounding 30% of city traffic,24 not to mention that eliminating curbside parking adds two extra lanes of capacity to many city streets. Traffic will become nonexistent, saving each US commuter 38 hours every year – nearly a full work week.25 As parking lots and garages, car dealerships, and bus stations become obsolete, tens of millions of square feet of available prime real estate will spur explosive metropolitan development. The environmental impact of autonomous cars has the potential to reverse the trend of global warming and drastically reduce our dependence on fossil fuels. Passenger cars, SUVs, pickup trucks, and minivans account for 17.6% of greenhouse gas emissions26 – a 90% reduction of vehicles in operation would reduce our overall emissions by 15.9%. As most autonomous cars are likely to be electric, we would virtually eliminate the 134 billion of gasoline used each year in the US alone.27 And while recycling 242 million vehicles will certainly require substantial resources, the surplus of raw materials will decrease the need for mining. But perhaps most exciting for me are the coming inventions, discoveries, and creation of entire new industries that we cannot yet imagine. I dream of the transportation cloud: near-instantly available, point-to-point travel. Ambulances that arrive to the scene within seconds. A vehicle-to-grid distributed power system. A merging of city and suburb as commuting becomes fast and painless. Dramatically improved mobility for the disabled. On-demand rental of nearly anything you can imagine. The end of the DMV! It is exciting to be alive, isn’t it? If you are still with us. Click to view a good TED talk about how driverless cars work.